The purpose of the study was to report a case of a cyclodialysis cleft with hypotony maculopathy. 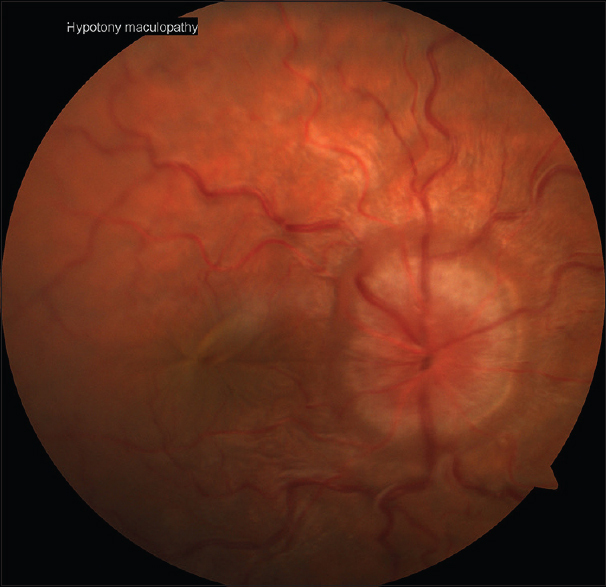 A 19-year-old boy with a history of blunt ocular trauma was referred for persistent hypotony. His vision was counting fingers (CFs) at 1 m with cataract, hypotony maculopathy, inferior choroidal detachment and cyclodialysis cleft, and intraocular pressure (IOP) 6 mmHg. 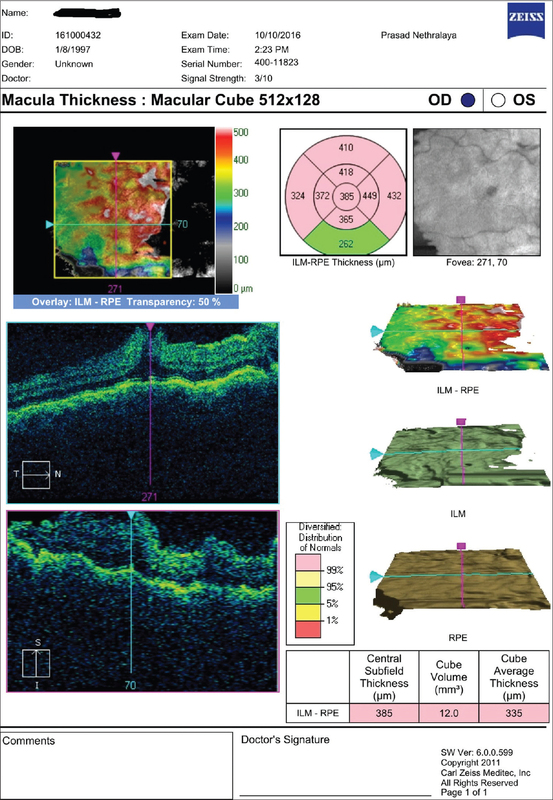 Optical coherence tomography revealed macular thickening with retinal folds and epiretinal membrane (ERM). He failed to respond to conservative management with atropine and steroids. Cataract surgery with pars plana vitrectomy with ERM peel and SF6 tamponade was done. After 1 month, IOP was 17 mmHg, and best-corrected visual acuity was 20/30. Vitrectomy may be effective in refractive hypotony. We describe a case of traumatic cyclodialysis cleft and hypotonic maculopathy which failed to respond to cryotherapy and conservative medical management was later treated successfully with pars plana vitrectomy and gas tamponade. In our extensive literature search, only two cases of similar management have been reported. A 19-year-old boy, diagnosed elsewhere with right cyclodialysis and hypotonic maculopathy due to blunt trauma, was referred to our center for further management. He had undergone cryotherapy previously but failed to respond. On examination, he had best-corrected visual acuity (BCVA) of CF at 1 m. Examination showed corneal striae, shallow anterior chamber, and early cataract with intraocular pressure (IOP) 6 mmHg OD and 18 mmHg OS. Gonioscopy revealed cyclodialysis cleft extending from 11 to 2 o'clock position, localized ciliary body detachment, and blood in Schlemm's canal. Fundus showed right eye mild vitritis, disc edema, tortuous vessels, hypotony maculopathy, and inferior shallow choroidal detachment [Figure 1]. Left eye examination was unremarkable. 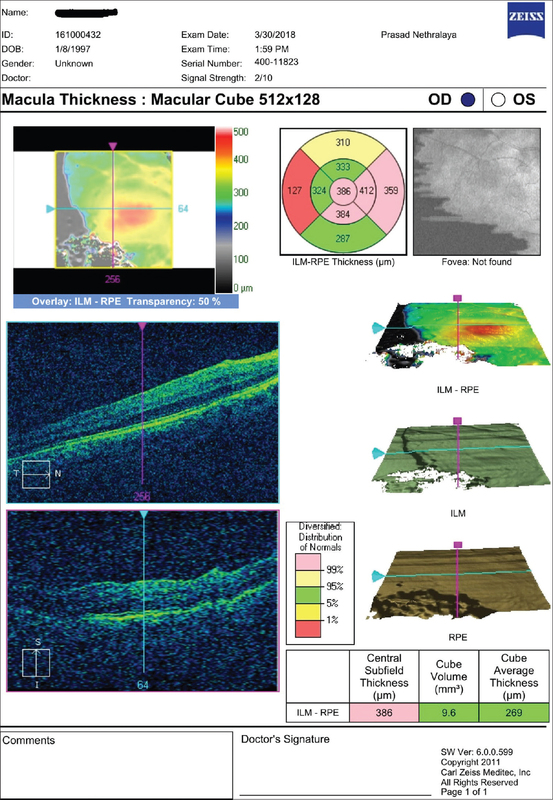 His optical coherence tomography (OCT) revealed a macular thickening with retinal folds and epiretinal membrane (ERM) [Figure 2]. He was initially managed conservatively with difluprednate drops (0.05%) six times/day, topical atropine (1%) three times/day, and a peribulbar Depo-Medrol injection. After 3 weeks, there was no visual improvement and persistent hypotony. It was then decided to undergo vitrectomy and gas endotamponade. Phacoemulsification, followed by 23-G pars plana vitrectomy with internal limiting membrane peel, was done. 18% SF6 was injected and patient told to maintain propped-up position for 1 week for tamponade. On postoperative day 1, he was noted to have an IOP of 10 mmHg and well-formed AC. He maintained head-up position for 1 week. During the 1st week after procedure, IOP increased to 15 mmHg. 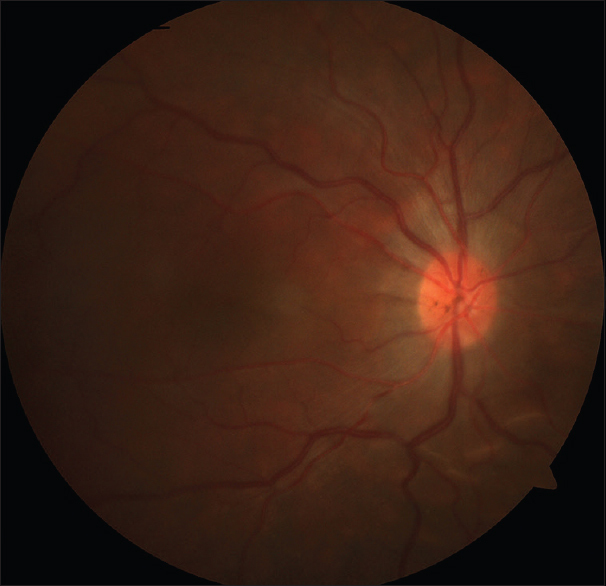 One month after the procedure, there was a complete resolution of the hypotony maculopathy, and the BCVA improved to 20/30 and IOP 17 mmHg [Figure 3]. OCT showed normalized thickness and resolved retinal folds [Figure 4]. Complete closure of the cleft and ciliary body reattachment was confirmed with gonioscopy. Informed consent was obtained before the intervention. A more recent development is to combine transconjunctival cryotherapy with the injection of gas into the vitreous cavity to achieve apposition by internal tamponade. This technique combines the principle of direct mechanical apposition of the detached ciliary muscle to the sclera by gas bubble and inflammation and scar induction by cryotherapy. The use of transconjunctival cryotherapy with pars plana vitrectomy and internal gas endotamponade has been applied in the treatment of persistent cyclodialysis clefts. Helbig and Foerster described this technique. In our case, a similar technique was used; though we combined it with phacoemulsification and ERM peel, we also avoided the use of repeat cryotherapy. We performed an early intervention with pars plana vitrectomy and SF6 tamponade in the 3rd month after trauma considering the young age of this patient and a need to avoid irreversible wrinkling or fibrosis of the retina and early normalization of IOP. In our opinion, pars plana approach is optimal primarily because traumatic cyclodialysis is rarely a standalone phenomenon. Other modalities of management do not address this. Hypotony is inevitably associated with accelerated cataract formation which can be dealt with phacoemulsification. Our management modality provides 360° endotamponade thence dealing with any missed cyclodialysis clefts. We did not apply gas tamponade alone (Pneumatic Retinopexy) in our case, due to ERM and his young age as the vitreous is not liquefied, the gas bubble may not provide a sufficient internal tamponade effect for the detached ciliary body to approximate the sclera. In addition, the gas bubble in the vitreous base may induce retinal traction and subsequent retinal detachment. Therefore, we combined vitrectomy, ERM peel, and gas tamponade. 'In a cleft with moderate-to-large extension (>90°), vitrectomy as well as gas tamponade may be modified by additional cryotherapy to induce better scar formation and advance cleft closure. Helbig et al. presented a case with the cleft positioned from 4 to 9 o'clock (170°), and the patient was told to remain in a supine position for 5 days postoperatively. The existence of multiple treatment options for cyclodialysis cleft repair itself points to lack of a gold standard procedure and hence warrants larger-scale studies comparing efficacies and visual outcomes of different management modalities. The authors certify that they have obtained patient consent form. In the form, the patient has given his consent for his images and other clinical information to be reported in the journal. Brubaker RF, Pederson JE. Ciliochoroidal detachment. Surv Ophthalmol 1983;27:281-9. Ormerod LD, Baerveldt G, Green RL. Cyclodialysis clefts: Natural history, assessment and management. InOpen Angle Glaucoma 1986. p. 201-25. Ioannidis AS, Barton K. Cyclodialysis cleft: Causes and repair. Curr Opin Ophthalmol 2010;21:150-4. Aminlari A, Callahan CE. Medical, laser, and surgical management of inadvertent cyclodialysis cleft with hypotony. Arch Ophthalmol 2004;122:399-404. Demeler U. Surgical management of ocular hypotony. Eye (Lond) 1988;2(Pt 1):77-9. Ormerod LD, Baerveldt G, Sunalp MA, Riekhof FT. Management of the hypotonous cyclodialysis cleft. Ophthalmology 1991;98:1384-93. Ceruti P, Tosi R, Marchini G. Gas tamponade and cyclocryotherapy of a chronic cyclodialysis cleft. Br J Ophthalmol 2009;93:414-6. Barkan O. Cyclodialysis: Its mode of action. Histologic observations in a case of glaucoma in which both eyes were successfully treated by cyclodialysis. Arch Ophthalmol 1950;43:793-803. Mardelli PG. Closure of persistent cyclodialysis cleft using the haptics of the intraocular lens. Am J Ophthalmol 2006;142:676-8. Malandrini A, Balestrazzi A, Martone G, Tosi GM, Caporossi A. Diagnosis and management of traumatic cyclodialysis cleft. J Cataract Refract Surg 2008;34:1213-6.